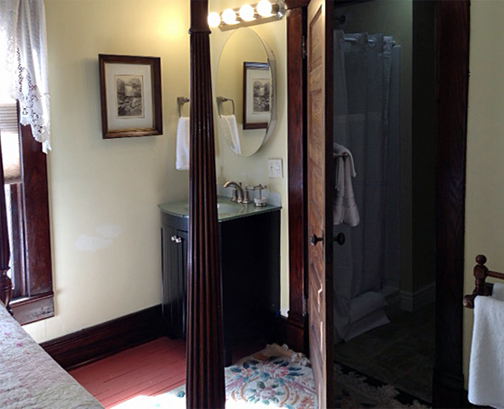 Below is a photo tour through the rooms at the River House. 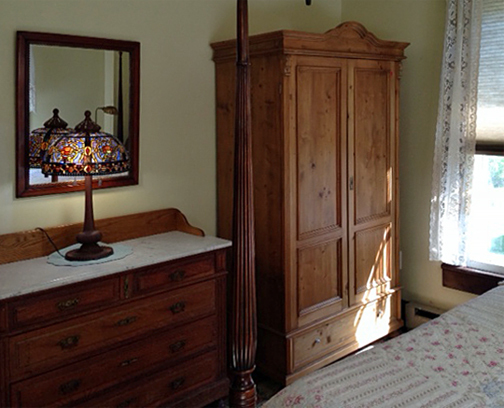 Each room is decorated with period furnishings--complete brass beds and old fashion commodes. The latter we look at today as antiques and marvel at how far indoor niceties have come. Each room is numbered and also has a local name for flavor. We have chosen railroad names in keeping with the history of the house and the town in which it is located. For those of you unfamiliar with the early days of railroading in the area, Rodemer was a small unincorporated town along the B&O between Rowlesburg and Terra Alta. It no longer serves a function after the steam era and has all but faded away now except for a few houses. It was once important enough for the "Consolidation" (a local train that stopped at all of the little whistle stops along the B&O)﻿ to stop for passengers. . Here we see a photo of the suite. Notice the Irish linen press and marble top bureau. The lamp is a Tiffany. Well not a real one, of course, but a very good reproduction. 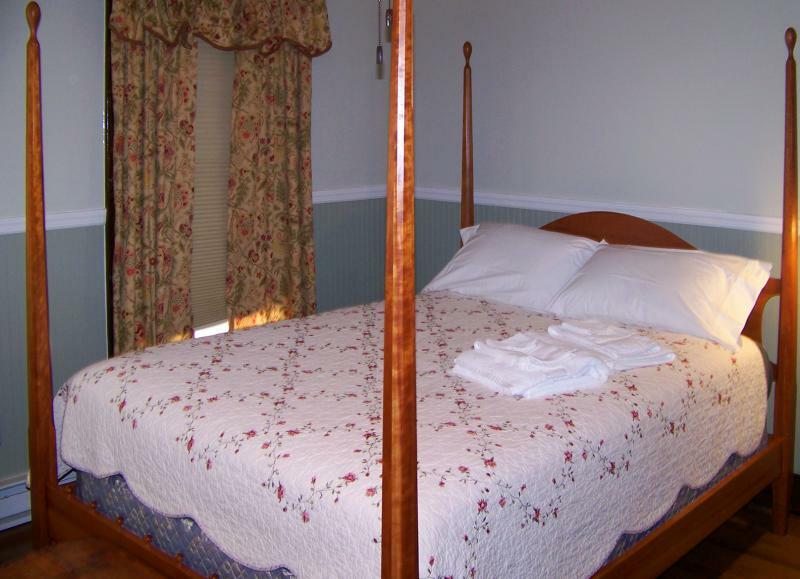 The bed is an elegant four-poster of the kind made very popular after the Centennial Celebration of 1876. Here is a different angle showing the bath (with shower) and lavatory in the bedroom--very common practice in hotels of the early 1900s. Space was at a premium because the Victoria sense of wastefulness did not call for extra large bedrooms. We pleased to use Birch Root Farms toiletries in our rooms. This are locally made by Robin and Jim Davis of nearby Etam, WV (http://www.birchrootfarms.com). Their products are made from goat's milk right on their farm. The goats they raise themselves. Below are a few examples of their range of products. We use ESA line of Accent Amernities at the River House Lodge. Accent Amenities is a luxury supplier of soy based and crafted vegetable based soaps. Their toiletries are made using spa quality formulations, minimal preservatives, post consumer non-bleached board. We are proud to use these products! This suite includes a second adjoining room and is very convenient for families. Each room has a double bed. 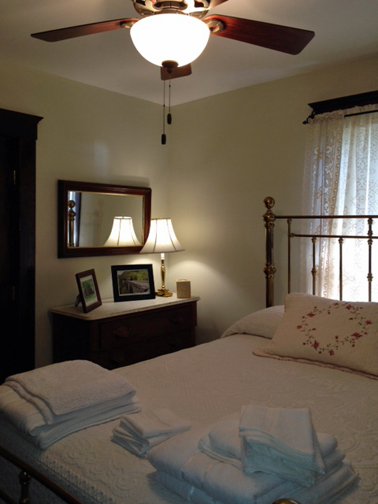 Part of a two-bedroom suite, this room has the brass bed as shown in photos below. 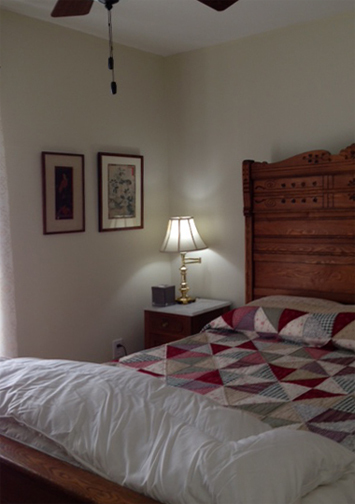 This bed came from the home of James and Sandra Weaver of Clarksburg, persons of refinement. Notice the fan. Each of the bedrooms has a fan and ceiling light. This is for the comfort of our guests during summer evenings. In Rowlesburg, air conditioning is rarely needed in the old Victoria homes because of their design--high ceilings and plenty of ventillation. However, each room is air conditioned for those unusually hot days of summer. 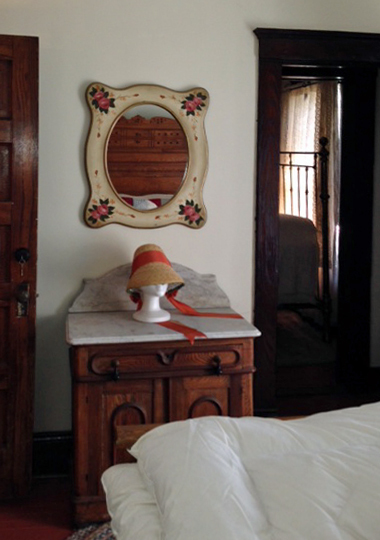 The next photo of the Salt Lick Arch Room is a Victorian Rose adorned mirror and marble top commode. These items came from New England but were commonly found in bedrooms all over America at the turn of the century. The lady's straw sun bonnet would have been a commonly found item as well. This large suite with wonderful light and plenty of room to stretch out is named for one of the most famous places on the old Baltimore and Ohio--the M&K Junction. This was the heart of the interlocking system that once controlled mountain railroading on the Cumberland Sub Division. Often photographed and written about by Charles Roberts, the M&K dominated railroading in this region for 150 years. Now crews are dispatched from Jacksonville and all of the interlocking is handled there as well. This room is named for the famous bridge and ravine in Cheat Valley. This geographic feature presented the B&O with a serious impediment to completing the new railline to Grafton and on to Parkersburg. The problem was solved by a young mathematician, Alber Fink, who designed an elegant solution. His bridge design is today on the World Heritage List of 100 bridges. Made of iron and a stonework, the bridge carried traffic during the Civil War and was a vital part of Lincoln's lifeline.